There was a time when I would have rolled my eyes and muttered "Whatever next? ", but now it seems there are no limits to cordless versatility; the cable-less workshop is perhaps closer than we think. Makita are generally among the first manufacturers to lead the way with new cordless products and the BBO140, their latest release, is a typical Makita interpretation of an old classic. Sanders and planers are probably the tools that are most restricted by having a cable attached to one end, so the move to cordless power is certainly a logical step, at least on paper. Let's talk about numbers first. 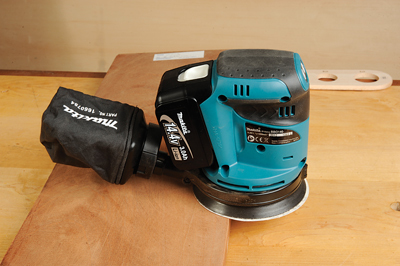 A diameter of 123mm, hook-and-loop pad, three speeds - 7,000, 9,500 and 11,000rpm - and a 2.8mm orbit are the perfect spec for a finishing sander. The on-board extraction is surprisingly effective, capable of blowing a fair draught from the 16mm diameter port, but even more impressive is how quiet it is. It's also very low on vibration, so comfortable to use over a prolonged time, though the body is big compared to some machines. The complete unit weighs 1.65kg of which around 0.5kg is battery. It can't be helped I suppose, but there's no escaping the fact that it is a tad heavy and oddly balanced, so much that as a consequence you might end up struggling to maintain even pressure across the pad when working a large area. A heavy machine can certainly be an advantage if you're intent on removing a lot of material quickly. Overall it is very user-friendly, with all the controls mounted at the front. On horizontal surfaces the weight is not so much of an issue, but start sanding the inside of a carcass wall and it could turn into a bit of a workout. 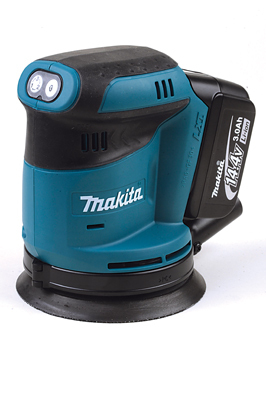 As an accompaniment to your existing Makita family it is a fantastic addition, but as a well-mannered finish sander it does fall a bit short.